The work of several master jewelers is featured on this page. More Loloma work further down the page. An incredible -it-can-only-be-one-of-a-kind necklace by Sam Patania. Fashioned of 18k gold and set with some of the finest natural turquoise ever to come out of the Candelaria Mine in Nevada. Destined to be an heirloom. $16,000. A 14kt gold bracelet inlaid with rich deep red coral with turquoise and a fossil ivory accent. Just over 1/2inch wide. 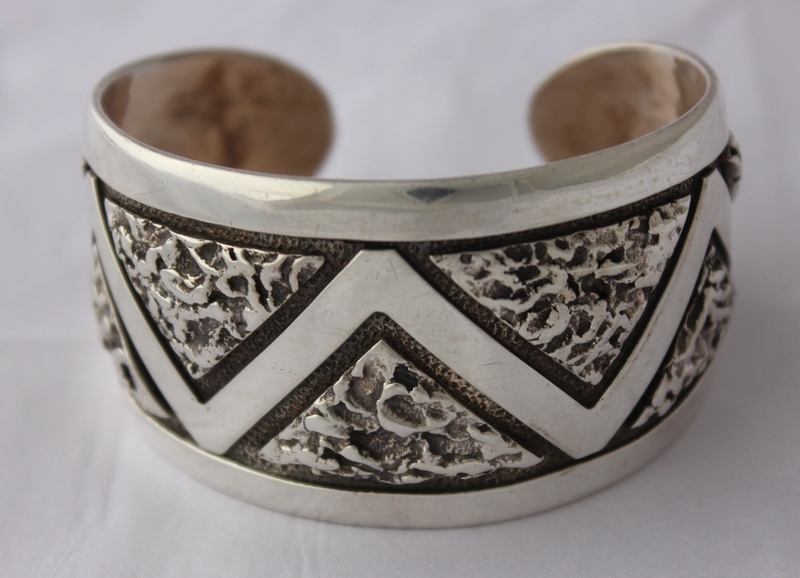 By long-time award-winning Navajo jewelry artist, Victor Beck. $4000. The Patania Family - the only family of metal smiths to have their work included in the Smithsonian Museum (in the Renwick Gallery). Frank Patania Sr came to this country with his widowed mother in 1908, fleeing the devastation of an earthquake in Messina, Sicily, where he had been apprenticed at age 6 to a goldsmith. While in New York he contracted TB and was sent to Santa Fe in 1924 to recover. By 1927 he was well enough to open his own silversmith shop in Santa Fe (and in Tucson in 1937) with his brother Carmelo “Pat” where he forged a new design aesthetic that reverberates to this day - a unique blend of Old World metalworking and the influence of the Southwest. Over the years many American Indian jewelers have apprenticed with the Patania family. Frank Jr (b 1932) began working full-time as a silversmith in his father’s shop in 1956. Over time he made his mark creating very modern pieces, including liturgical work – some of it monumental in size. His son Sam, the third generation, is forging into yet new territory, inspired by the work of the previous two generations but reflecting his own artistic vision. Joining them is the newest Patania apprentice: 4th generation Marco. Both bracelets by Frank Patania Jr. Each is 1.5 inches wide and made for a medium-small wrist (just over 5.5 with a 1 inch opening). $1100. The earrings at right, circa 1950s are from Frank Patania Sr's shop. Two 18k gold hand-wrought bracelets by Frank Patania Jr, Both are 1/2 inch wide, measuring 5.25 inches with a 1+ inch opening. The one at left, set with natural, top-grade spiderweb turquoise from the #8 Mine in Nevada is $6,450. The other, with white gold dots, is $2450. Both are in Tucson. Work by the legendary Hopi artist Charles Loloma (1921-1991), who opened the door to amazing innovation in American Indian jewelry beginning in the early 1960s. A ceramicist by training (he and his wife, Otellie, earned a degree in ceramics from Alfred University's School for American Craftsmen in 1949) He and my father met in the mid 1950s and became lifetime friends and I spent the summer with Charles at his tiny studio outside the village of Hotvela when I was 15, but it is far more than personal friendship and regard that makes me say that Charles was one of the seminal jewelers of the second half of the 20th century. Please note that there are counterfeits of Loloma's work out there. We provide written documentation on each piece, including the prior owner's signature. Both from the collection of a musician and record shop owner in Tucson who acquired them from Charles in the very early 1960s. Unsigned but full documentation authenticating it is available.It was hammered from behind to provide dimensionality. 3.25 by 1 1/8 inches and made for a 3/4 to 7/8 inch belt. $8500..The men's bracelet at right is a design that I've never seen repeated. 1 7/8 inch wide. $10,5000. The bracelet is set with Persian turquoise in a 14kt gold bezel. 1 /78 inch across. It fits a medium-small wrist and was acquired by the late owner in the 1970s. $12,500. An incredible piece by Larry Golsh (b 1942, Pala Mission and Cherokee) in 18kt gold set with a pearl. Below is the reverse, set with black mother of pearl and a diamond. 20 inches long, the pendant itself measures 2.25 by 1.25 inches. $9,200 (SANTA FE).